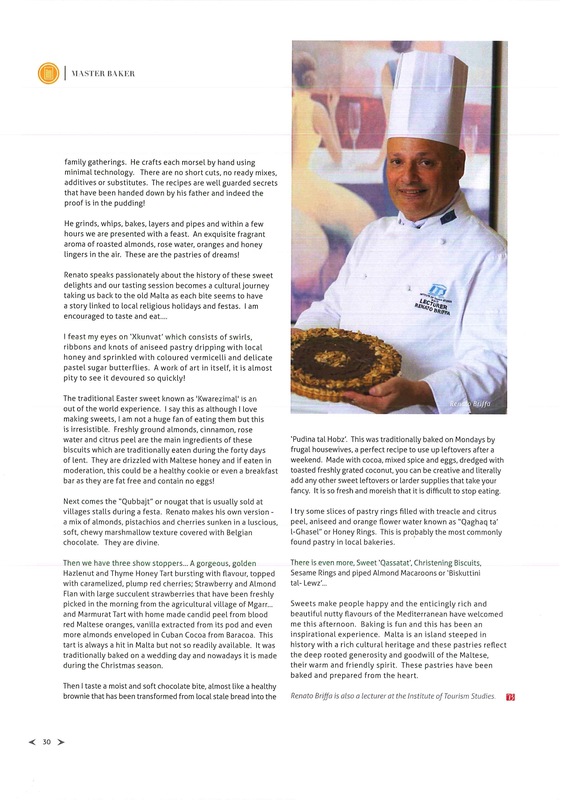 Hazlenut and Thyme Honey Tart…. Celebrate Father’s Day ! 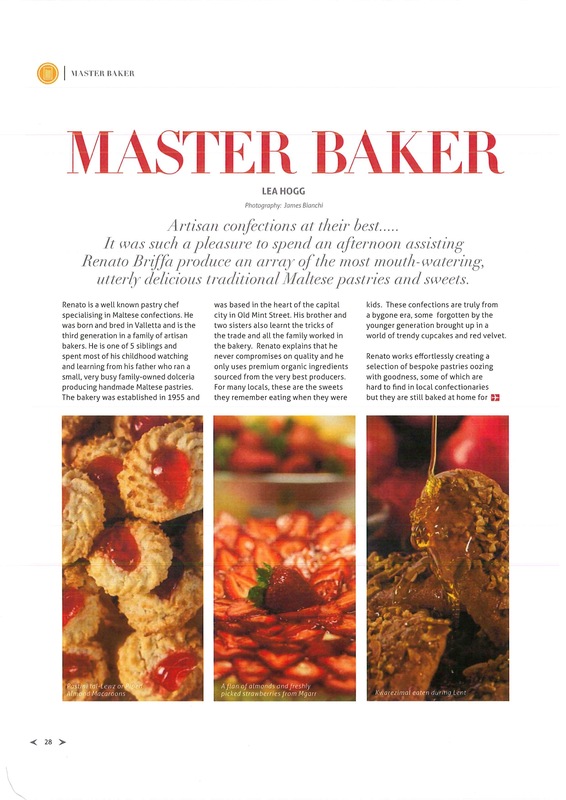 This recipe was given to me a few days ago by Renato Briffa as I was looking for something special to bake for someone’s dad, not my father as sadly he is no longer with us. It was created by Renato’s father Guzi in 1955 as a speciality for the family Dolceria in Old Mint Street in Valletta. It is straightforward to make as it does not have a long list of ingredients. I like to use Maltese Thyme Honey which is harvested during these months but you can of course use any kind of honey. 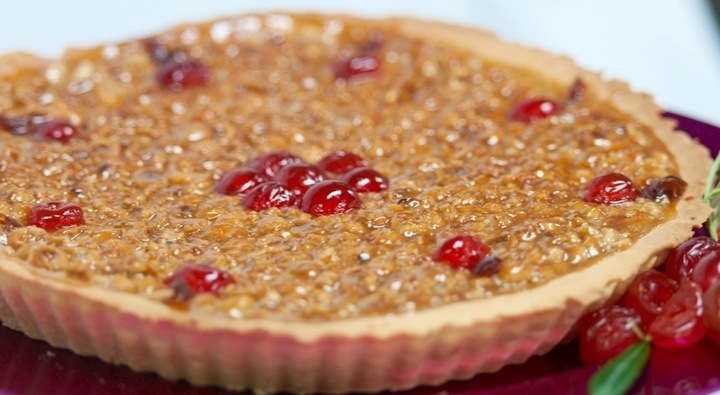 With flavours of old Malta revived, this tart is bound to be a crowd pleaser ! To all fathers tomorrow whether still with us or not, thank you from the heart and Happy Father’s Day ! Sieve flour and baking powder into a large bowl. Add butter cut up into small pieces. Rub in until you have a fine consistency. Add vanilla extract, lemon zest and cinnamon. Dissolve sugar and cold water and mix into dry ingredients. Knead and leave to rest wrapped in cling film in a cool place for at least 15 minutes. Grease the tart dish and roll out pastry on a lightly floured surface. Line the dish and trim neatly. Dock the pastry with a fork. Roast the nuts in the oven until they are a light gold colour. Cool and place in a plastic bag. Crush lightly with a rolling pin but do not over do it. The nuts need to be large and chipped. Melt the butter on very gentle heat. Add the sugar and honey and stir, still on low heat, until the sugar is dissolved. Remove from heat. When cool, add the Hazlenuts and put filling into the pastry case and bake for 25 – 30 minutes. Take out of oven and leave on a wire rack to cool completely in the tart dish. When you take it out of the oven the consistency should be runny but as it cools down the filling sets. Then gently take it out of the tart dish and you may need to use the point of a sharp knife to help ease it out. Decorate with cherries. 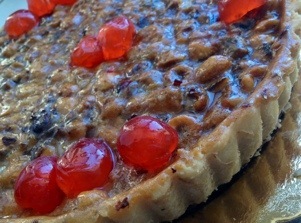 This tart will last for a few weeks if stored in an airtight container and the flavor improves. No need to refrigerate. Tell us about your results….